DEVA advocates for electric vehicle adoption and supports the development of EV infrastructure regionally. DEVA is a special kind of car club made up of electric vehicle owners, prospective owners, and enthusiasts from the Davis and Sacramento area. DEVA is a working group of Cool Davis and an affiliated sub-group of the Sacramento Electric Vehicle Association (SacEV), a chapter of the national non-profit Electric Auto Association. DEVA typically meets 2nd Wed every other month in Feb, April, June, Aug, Oct, and Dec at the Indigo/RePower office at 909 5th from 6:00pm - 7:30pm. For more information or to be added to the EV mailing list, send inquiries to deva@cooldavis.org. DEVA held their very first meeting hosted by members of SacEv and Cool Davis, Sunday, August 27, 2017, where over 24 members gathered to share stories and enthusiasm for alternative fuel vehicles. DEVA member Katrina Sutton shared her excitement for her 2011 Chevy Volt and DEVA membership. 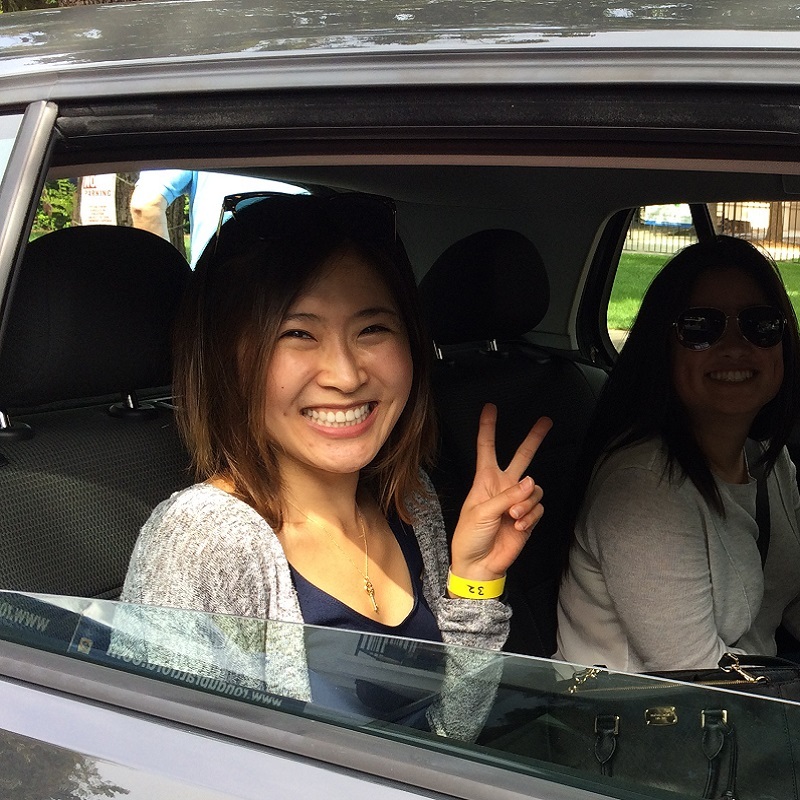 “I can do anything I need to do around town [in my Volt], and I don’t need gas … It’s just awesome!” said Sutton, who is also a Plug-in Hybrid & Electric Vehicle Research Center Program Analyst at UC Davis. With a name like DEVA and a mission of fun, who could resist this fabulous new way to make new friends, educate neighbors, and reduce the number of combustion engines on the road. DEVA meets 2nd Wednesdays every other month in Feb, April, June, Aug, Oct, and Dec at the Indigo/RePower office at 909 5th from 6:00pm to 7:30pm. DEVA meetings host guest speakers on various EV topics. The group’s first meeting featured Robert Haran’s presentation on Vehicle-to-Grid technology, a potential way for plug-in EVs to transfer energy back and forth to the grid. Future meeting ideas include guest speakers from Tesla, EV market updates, Davis Community Choice Energy (CCE) and Yolo County Valley Clean Energy Alliance (VCEA) programs, EV charging and battery care, PG&E EV charging station rollouts, and EV travel stories. If you would like to sponsor one or more of our meetings contact Chris cgranger@cooldavis.org. Sept 16 2017: EVs @ the Market! Sept 15 2018: EVs @ the Market! Visit the Cool Davis blog for info about this year’s event. National Drive Electric Week is a nationwide phenomenon each fall when local groups put on community-sponsored events supporting EV adoption. The event promotes awareness of EVs and plug-in hybrid vehicles, and allows attendees to chat with EV owners getting the inside scoop on their success stories before testing dealer vehicles. 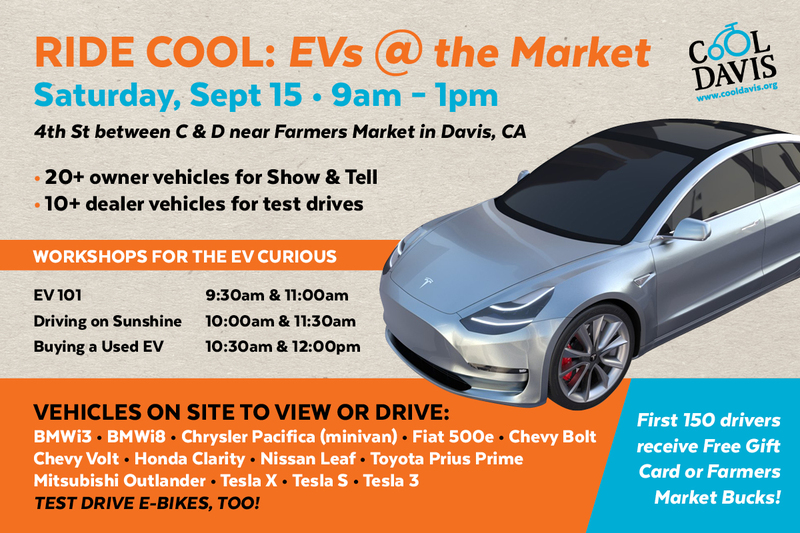 Attendees get to view and test drive a diverse collection of EVs all in one convenient stop. Visit National Drive Electric Week for past event highlights and upcoming events. 2018 National Drive Electric Week is slated for September 8-16, 2018. Visit the Cool Davis blog for all the details of this year’s event.